The new Mercedes E-Class Coupe took on a totally different perspective for me when two things happened. First, I saw it in the flesh. Secondly, I learned that more Irish women (53pc) than men bought one last year. I’d honestly believed it to be it very much a man’s car. Well folks (you notice I am being gender neutral here) all I can tell you is you’re in for a treat on looks, style and comfort. Should you also be seeking excitement, verve and whoosh, well I wouldn’t be holding my breath. I can’t say any more for now because I’ve given my word not to divulge my driving impressions until next week to comply with global agreements (embargoes to you and I). I’ve never broken one so I won’t start now. And anyway I have loads of other stuff to tell you about. Expect to see the new coupe here in early-April when it will join the existing saloon, estate – a Cabriolet comes later. Let me say straightaway that the pictures don’t do it justice. It’s hard to believe that front – especially with the flat diamond grille (gorgeous) – is on an E-Class as most people would expect it to be conservative and formulaic. Mercedes doesn’t do conservative much any more. The rear is more classically rounded-rump curve which echoes the BMW 6-series and the side-on profile hints at a pumped-up Audi TT look. Those are all compliments by the way. But the interior is all Mercedes. Their cabins are now the best in the entire mid-size segment – easily beating BMW and nudging Audi, I feel. With its double screen display and interactive touchscreen (not standard) stretching across the dash, you’re almost in a cinema. The thing is it’s all information or entertainment are functional and easy to use. And I sat comfortably in the back (which is why they call it a four-seater). Big doors make it easy to access and exit; frameless side windows and no B-pillar help, too. Yes, my colleague drove on happily out front while I nestled easily behind. I couldn’t do that in too many coupes. It is an unquestioned four-seater. Helping on that front is a longer overall stretch than its predecessor though it is 10cms shorter than the saloon. It is also wider and taller than before. You just feel spoiled in it. And isn’t that what it is supposed to do? A few more facts: track width up 7cms; it’s 50mm lower than saloon and there has been a 66mm cut in wheelbase. You can pick your suspension: ordinary mechanical; air suspension; Dynamic Body control. Hint: pick ordinary mechanical. There will be one diesel and three petrols from launch. Those likely to be in demand include the E200 petrol and E220d diesel. The 1991cc, 4cyl, 184hp petrol will cost from €52,310. The new 2-litre (1,950cc) 4cyl diesel in the E220d pumps 194hp, and is marginally more expensive at €52,995. 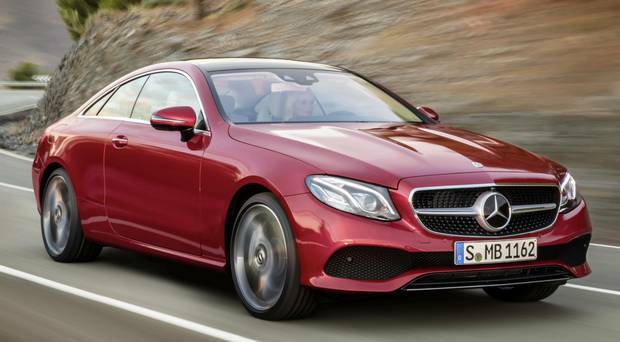 All E-Class coupes sold last year were diesel. Not one petrol. No price yet for the other two petrols: the E300 has the same 1,991cc 4cyl petrol as the E200 but it manages 245hp. And there is the 2,996cc, 333hp, V6, E400 4MATIC. Prices are only marginally up all around. The old car started from €52,030 (E220d automatic diesel – €52,030); the E200 petrol cost €49,000. But the difference in spec is marked – not to mention all the mechanical advances. For example, the old one didn’t have the likes of Active Park Assist, rear view camera, heated front seats, 18ins alloys, seat-comfort pack, Garmin map pilot etc. Overall, spec mirrors that of the saloon and estate, including the remote parking pilot system which lets you move the car into a tight parking spot or narrow garage – from outside the vehicle. Other elements include a spread of driver assist systems as well as full smart-phone integration, infotainment as well as the optional semi-automatic driving. The rear window is vertically split to take in the triangular rear section for better over-the shoulder visibility. It’s a help. Senior Mercedes executives told me there is no direct competitor for the car. Maybe that’s strictly true but surely the BMW 6-series and Audi A5 ranges will proffer alternatives. As I’ve undertaken not to give driving impressions yet I can’t say anything. But it won’t take the geniuses among you to expect the excellent 194bhp diesel will be the choice for most – on mechanical suspension. I couldn’t possibly comment of course.